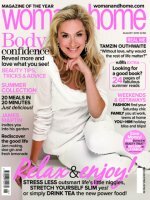 Woman and Home is the fastest growing lifestyle magazine for women. It presents a stylish mix of content that reflects the way women live and work today. Woman & Home is packed full of fashion you’ll love to wear, beauty to make you look glam, and great exercise and health tips to keep you feeling great inside and out. On top of this there are fantastic food and inspiring travel articles along with career advice, home interiors and much more. Find out what makes this one of the most popular titles around – order your Woman and Home Subscription today to receive the magazine every month, delivered to your door for free. Midlife marriage – would yours pass the MOT?… The Woman & Home smart guide to feeling good every day… Declutter your life – it’s time to simplify things… Body confidence – reveal more and love what you see… Twiggy tells Woman & Home Magazine about her passions – from sewing to singing – and the importance of a good night’s sleep… 8 non-diet tricks to help you lose weight… New season trends and 10 things that flatter every woman. For articles like this and so much more, subscribe to Woman & Home today! Who Reads Woman & Home Magazine? The core reader base of Woman and Home Magazine is over 35 years old and refuses to be pigeonholed. They have a ‘can do’ attitude and display it with spirit and style. Woman and Home readers often also enjoy a Good Housekeeping Subscription.